Ivan writes: "Our head is leaving at Easter, so we decided to make a giant penny portrait of her. I attach a photo of the final result. I took a photo of her and digitally corrected it to the pixel size that I thought would work, in this case 200X200. I then cut the image into 16 equal parts and enlarged each one on the photocopier to A3. I gave each of our classes one gridded section to enlarge onto 2cm gridded maths paper (large sheets). 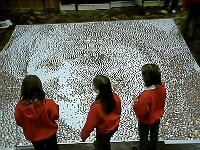 The children collected pennies in smartie tubes and then added the pennies to every square that was coloured black using the A3 enlargement I had given them as a binary code. The result was amazing and we collected over £250 which went towards materials for an arts fortnight in school."